The beauty of nucleic acids lies in their addressability; four monomers arranged in a specific order can convey a range of instructions from one oligomeric strand to another. To exploit these biomolecules, scientists use solid-phase chemical techniques to encode their own instructions, and frequently introduce non-natural modifications to prolong the life of the message or improve its clarity (specificity) in a biological system. However, as the boundaries of science expand, the questions we seek to answer are pushing the limits of conventional synthetic methods. To this end, the Brown group began exploring convergent synthetic routes to larger functional constructs from smaller nucleic acid strands in 2006. Using chemical methods, our approach was based on the now famous CuAAC ‘click’ reaction. From primitive initial experiments and iterative re-design we eventually succeeded, the key being the identification of a triazole linkage that mimics the natural phosphodiester group’s structural demands and its ability to hydrogen bond. Our linkage surpassed our expectations and was tolerated in ribozymes and by DNA and RNA polymerases to a remarkable extent. Supported by a large collaborative research grant (BBSRC sLoLa, BB/J001694/1/2; Extending the boundaries of nucleic acid chemistry), this set the stage for studies that explore its use in applications such as chemically modified gene synthesis. Works towards this paper began three years ago, when biological manipulation of the Cas9 protein was in vogue. The amazing discoveries made on an almost weekly basis strengthened our resolve that improved chemical methods to sgRNAs were necessary. We were acutely aware that sgRNAs underpin all CRISPR applications, the numbers being used per experiment were ever increasing, and that chemical synthesis of CRISPR RNA has important advantages over transcription-based methods; it is scalable and allows site-specific incorporation of useful modified nucleotides, elegantly illustrated by Mir et al. The final ‘Split-and-Click’ strategy we report was always in our minds, but we took a step-by-step approach cautious of traps that might ground the project at an early stage. Although there’s only one hydroxyl difference between RNA and DNA, the synthetic challenges should not be underestimated! In particular, optimising untemplated ligation of RNA strands proved trickier than expected (cf. DNA) but ultimately possible in reliable yields using methods accessible to end-user labs. Most constructs were active in vitro, but the true challenge for chemists that develop biological tools is to translate this to cellular activity. Fortunately for us, they were! 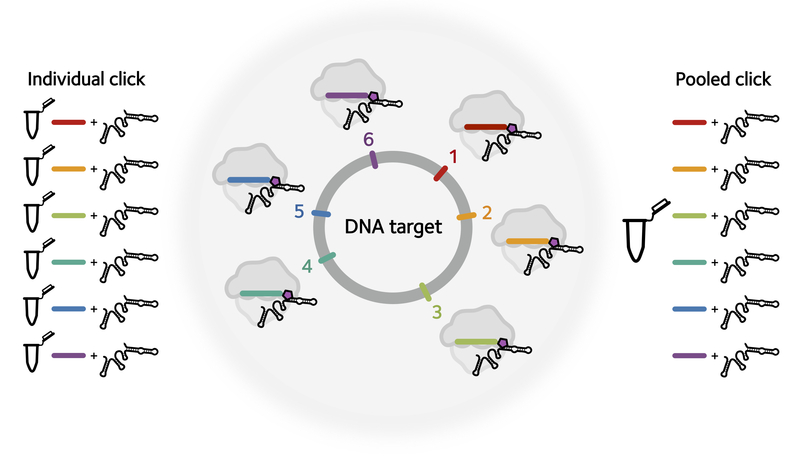 Our strategy enables the synthesis of standard or chemically modified CRISPR sgRNA libraries in a single tube by click ligation of an invariant Cas9-binding 79-mer (purified and kept on a large scale as a resource) and a library of variable genome-targeting 20-mers (prepared on demand and in high purity). The approach, being based on solid-phase synthesis, is compatible with the extensive toolkit of DNA and RNA synthesis monomer and reagents that are commercially available. Recent funding has provided us with the opportunity to apply this strategy to other aspects of gene editing that we are excited to explore.